This week found me playing four days in a row at different local private clubs. Needless to say, it was a fun week that just happened to line up and net me four new courses for my list. In theory, I saved the best for last. 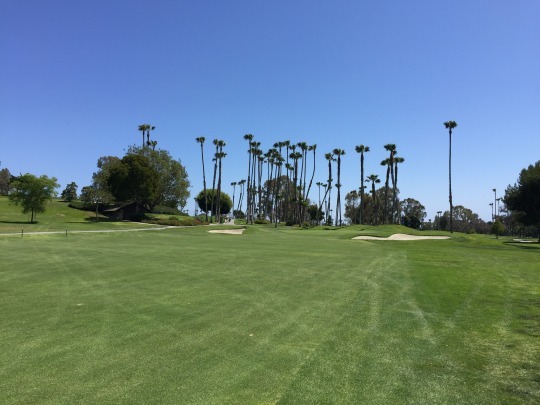 I say “in theory” because Newport Beach Country Club is probably the least interesting layout of the four I played this week. However, it is easily the most prestigious, expensive and difficult to access of the bunch. If you recall, last year some friends and I went in on a charity auction that included three awesome rounds. 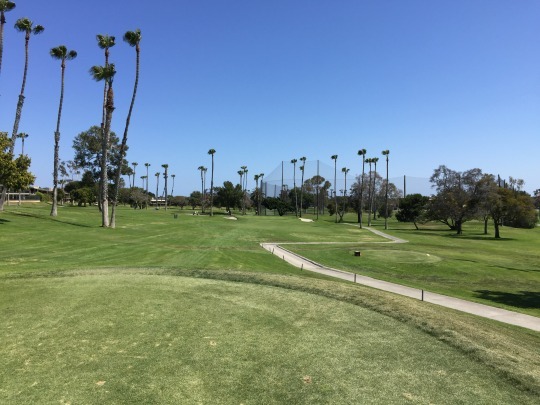 We had already played Shady Canyon and Big Canyon, so Thursday found us cashing in the round at Newport Beach. This one actually took awhile to set up through our member host. He eventually put us in direct contact with the head pro, who finally got us lined up to play this week and we couldn’t have picked a better day. I’ve been griping all week about the gloomy and chilly weather we’ve been having, but finally Thursday brought some clear blue skies and sunshine in the afternoon for my finale round of the week. 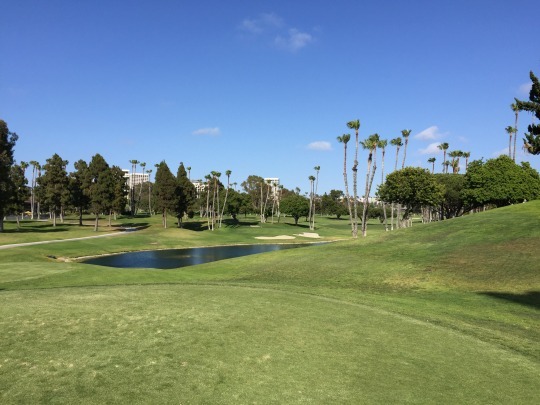 It was a picture perfect day in Newport Beach. The details were a little light, but we thought we had a 1:00 tee time. We all arrived well earlier. I didn’t realize they had just started a major renovation of their clubhouse, so things are a mess here right now. I definitely could have found out about it if I looked at their website beforehand, but the pro could have also given us a heads-up. They have a small temporary parking lot that was pretty full and then a row of temporary trailers serving as the locker rooms, restrooms, pro shop, dining room, etc. 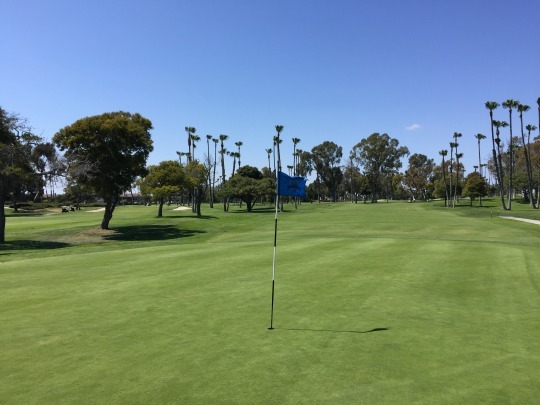 Part of the renovation includes a giant new practice putting green, so people were just kind of using the chipping green down by the range to roll a few putts. The organization was kind of loose here and the place was absolutely packed with members and guests. When we checked in with the starter a little before 1:00, we saw several groups lined up by the first tee ready to go out and even more waiting in the wings. We found out they don’t really make tee times here, so we just gave him our names and he slotted us in the queue. We used the extra time to hit a few range balls and practice some putts on the aforementioned chipping green. Ultimately, things moved along well enough and we were teeing it up at 1:25. The course was really busy with players, but we still finished in almost exactly four hours. That’s one nice thing about playing a private club on a regular day. 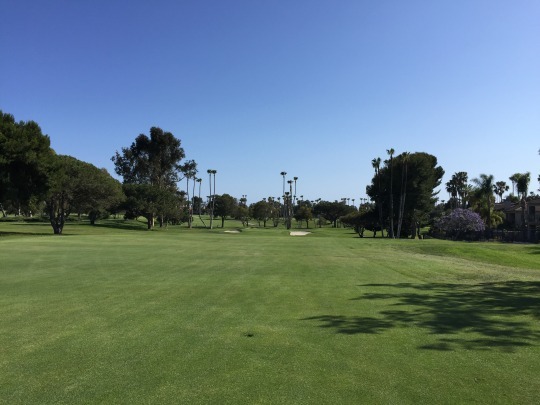 Members are used to moving quickly and keeping a good pace. 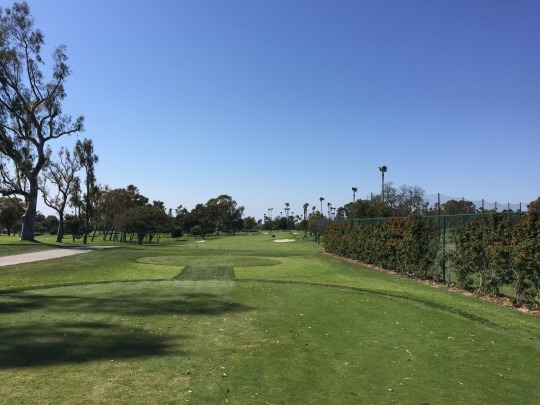 As for the layout at Newport Beach, I knew basically what to expect having driven by it plenty of times and also watched it on TV during the Champions Tour Toshiba Classic coverage. It’s a pretty traditional and relatively forgiving layout. 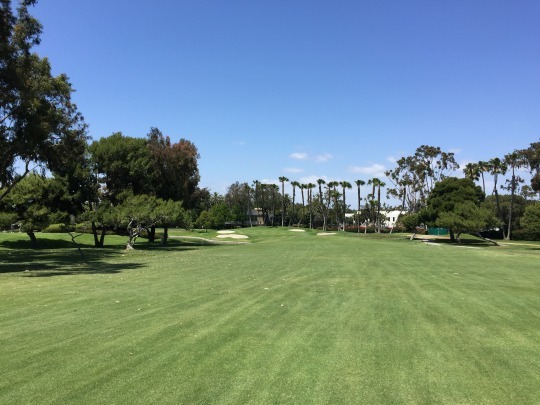 Holes run back and forth with some subtle changes in elevation and tree-lined fairways. 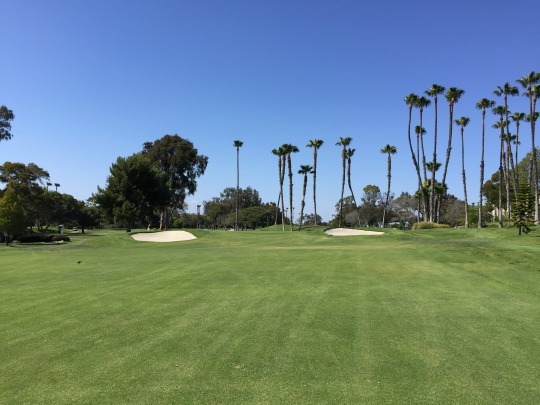 The most distinctive holes here are easily the two signature par-3s. 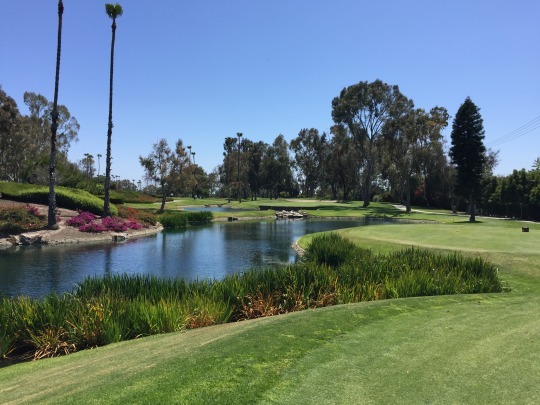 The 4th is a pretty one over water and the 17th is a demanding one, also with a big water hazard in play. 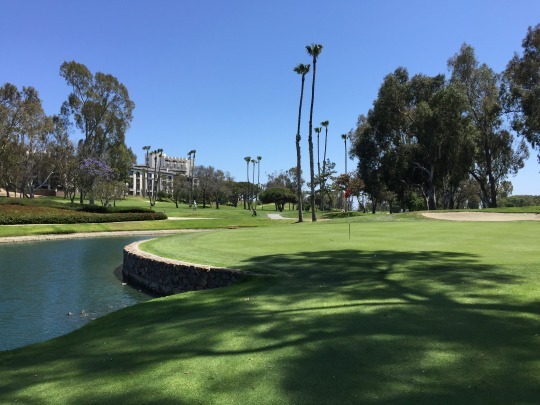 Beyond that, there isn’t anything overly distinctive about the Newport Beach CC course. It’s nice and solid, but it won’t “wow” you too much. 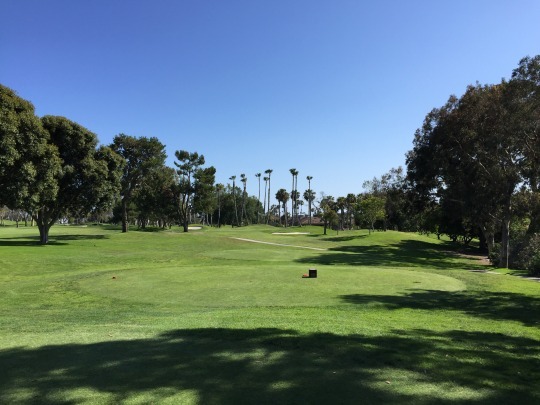 In some ways, it resembles a number of different muni courses throughout the area and also reminded me at times of the inland holes of Sandpiper. 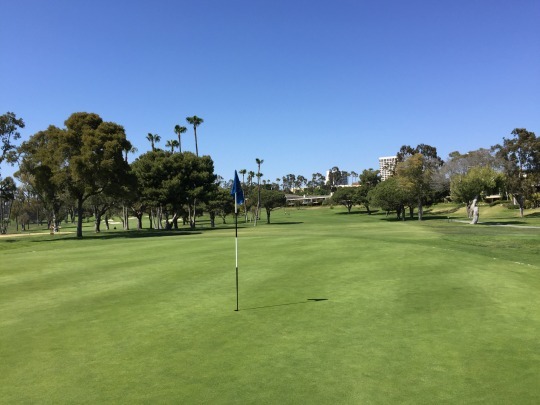 It’s kind of an amalgamation of a pretty standard layout that just happens to be in a prime Newport Beach location and part of a really nice country club. It also happens to be in exceptional shape, so it’s a million times nicer than any muni around and that helps add more appeal. 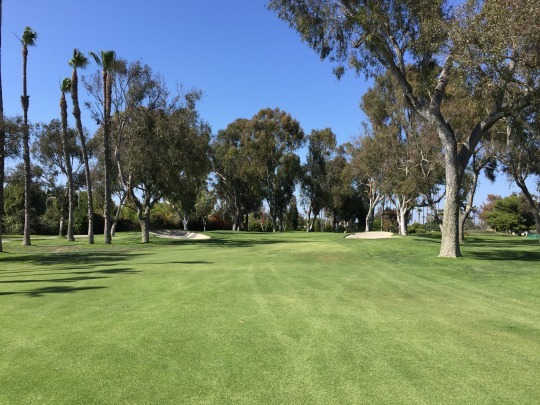 The tee boxes, fairways and primary cuts of rough were all perfectly maintained kikuyu. 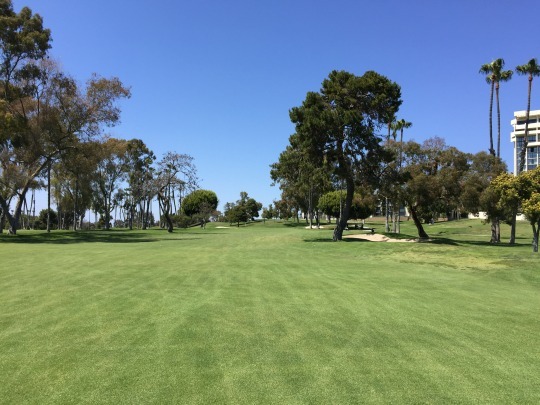 The outer edges of rough were typically a mix of kikuyu and poa annua (I think), so coverage wasn’t as consistent but the lies are much more challenging. The intermediate cuts were like hitting off a tee. The bunkers were also nice and the greens were amazing. They didn’t play as soft on approaches as they felt underfoot, but really well-struck balls would bite. They rolled really smooth and faster than they appeared. Practicing putts on the chipping green may not have helped as that seemed slower than the actual greens on the course. The greens here were very deceptively slick. You had to hit the ball firmly to get it to the hole and keep it online, but if you missed it was almost impossible to keep it within that “tap-in” range. 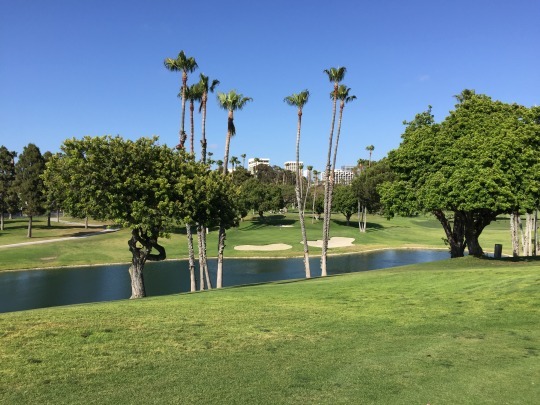 No matter which way you were coming from and what speed it had at the hole, it would always seem to slide by an extra 3-5 feet and leave you with a nervous comebacker. 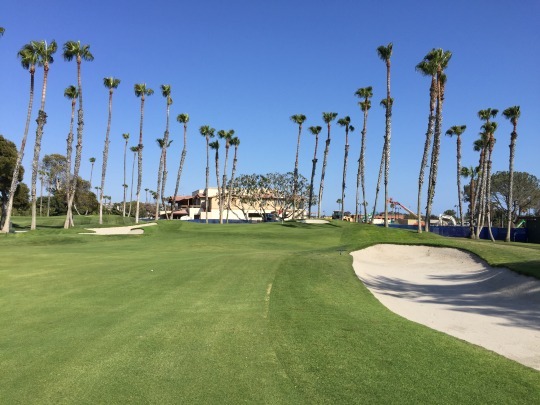 I can’t really say I got the full Newport Beach Country Club experience with the renovations going on around the clubhouse. We were amazed at how crowded it was out there and that kind of added to the “glorified muni” feel with a cattle call assembly line at the first tee. Still, once we were on the course, things moved along great and the fantastic conditions certainly let us know we were playing a nice private club. 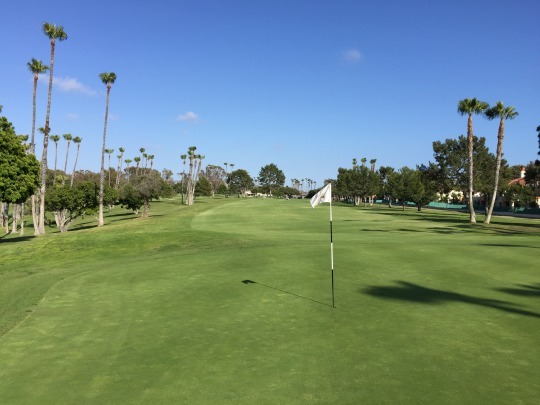 This is one of those clubs that is worth playing if you have the opportunity. 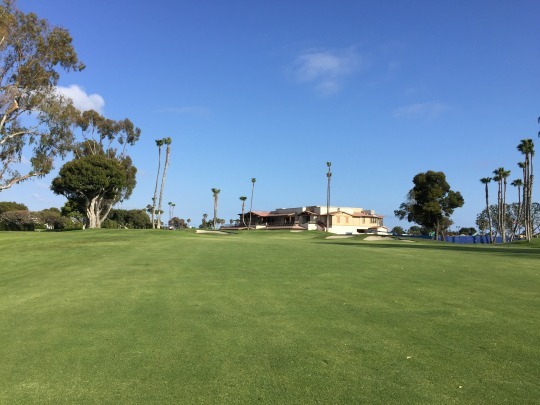 It’s a good experience on a fine course, but you’re paying for the prestige of playing one of the two swanky clubs in luxurious Newport Beach. 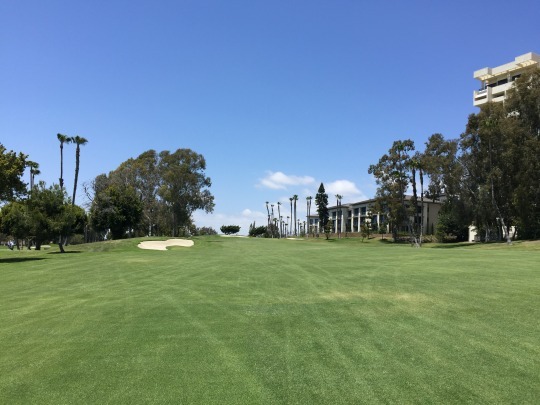 Big Canyon offers a fancier private club experience and I think the remodeled clubhouse at Newport Beach is meant to help it reach new heights of fanciness. 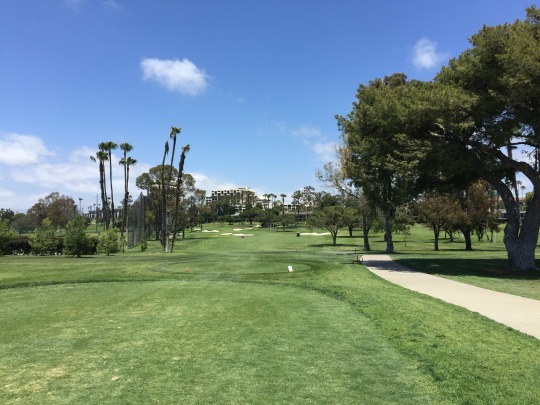 The conditions were probably a little nicer here than at Big Canyon (based on my personal experiences), but there’s no comparison in terms of the course layouts. If I had to choose, I would go with Big Canyon all day long. At the same time, I wouldn’t turn down another chance to play here if the price was right.